As a much younger person I remember being fascinated by Svetlana Beriosova. I guess she was the dancer I admired most when I was a ballet student, although I’m not sure why as I had never seen her dance. But she looked so coolly elegant from photographs, and I particularly remember images of her in what sounded from 1950s Sydney, thousands of miles away from London, like a very exotic ballet, Prince of the Pagodas. 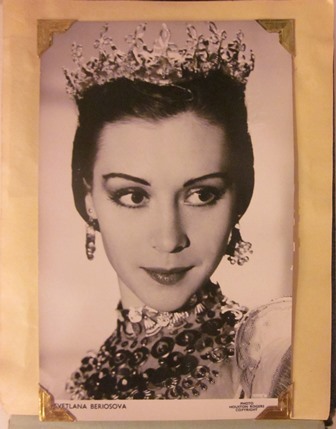 Beriosova did come to Australia with the Royal Ballet, which visited Sydney in 1958. I was there, autograph book in hand, as these stars from afar came out of the stage door of the old Empire Theatre at Railway Square. That season I finally saw Beriosova dance—as Swanilda in Coppélia. Prince of the Pagodas, however, remained a mystery. The first production, choreographed by John Cranko in 1957 to a commissioned score by Benjamin Britten, was short-lived. Kenneth MacMillan produced another version in 1989, which was recently restaged by the Royal Ballet. I didn’t have an opportunity to see either the Cranko or the MacMillan version, but I did catch a third version created by David Bintley in 2011. Bintley made his production for the National Ballet of Japan and it has just finished a season in London danced by Bintley’s Birmingham Royal Ballet. Sadly for my childhood dreams, it was one of the most disappointing shows (and it was a show in the more popular meaning of that word) I have seen recently. Bintley rewrote the narrative and set it in Japan but the story remains as crazy as ever, requiring a suspension of belief beyond belief. There are various reviews available online, along with accounts of the storyline and discussions of the history of the work, but I won’t post the links—they are easy to find. Suffice it to say that in 2014 I find it a little offensive to have characters called ‘Balinese Ladies’ who engage in choreography that vaguely references but basically, in my opinion, denigrates Balinese dancing; or rows of ladies dressed in long, pink gowns twirling pink parasols as if they are performing something called The Cherry Blossom Show. And I am mentioning just two of the more irritating (to me) elements of the production. Britten’s score might continue to deserve a place in the concert repertoire, especially as an example of the ubiquitous influence of the Balinese gamelan on Western composers of Britten’s generation, largely under the influence of the eminent Canadian ethnomusicologist, Colin McPhee. But as a ballet, Prince of the Pagodas should probably just disappear into the mists of time. I doubt if any amount of tinkering can save it. Beriosova’s image as a great dancer, however, remains intact for me. Just a few days ago I had the huge pleasure of encountering first hand the unpublished dance writing of Lionel Bradley, whom I now like to think of as a blogger before the internet, and the word ‘blog’, was invented. Bradley was a librarian at the London Library in the 1940s and a great lover of ballet and dance of all kinds (and of other forms of performance). 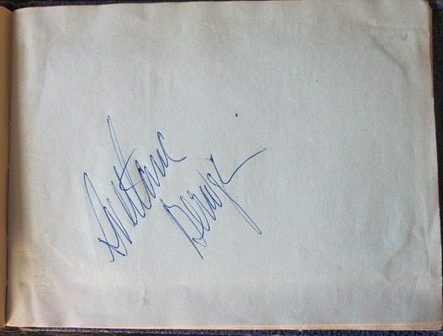 His handwritten dance texts, Ballet Bulletins 1941–1947 and Ballevaria Miscellanea 1937–1947, which he liked to circulate as he comleted each entry to a small group of friends, are housed in the Department of Theatre and Performance of the Victoria and Albert Museum, London. Although I was not there specifically to research Simple Symphony, as I had previously posted some thoughts about it it was a bonus to find that in his Bulletins Bradley had spent some time discussing early performances of this ballet by Walter Gore, which was a staple item in the repertoire brought to Australia on the Ballet Rambert tour of 1947–1949. Bradley was enthralled by the ballet. It was ‘a gorgeous success’ he wrote when he saw it for the first time in Torquay in December 1944 during one of Ballet Rambert’s regional tours. His discussion of the backcloth and costumes by Ronald Wilson is especially interesting as I have never seen colour photographs or colour footage of the work, or even a photograph showing the backcloth. ‘The backcloth for Simple Symphony‘, Bradley wrote, ‘depicts a seashore, somewhat after the manner of Christopher Wood. There are two piles of greenish stones, one tall and narrow, one somewhat shorter, and a suggestion of fish nets. There are two wings [flats] on either side, the one nearer the backcloth being light and blue with some nautical decoration, while the front ones are dark brown and reddish brown. Near the front is a low border showing 2 angels & fish nets’. Bradley goes on to describe the costumes and to discuss the structure of each of the four sections that make up the work. What wonderful resources Bradley’s writings turned out to be. My previous post on Simple Symphony is a this link. I was delighted too to learn that Jane Pritchard, curator of dance at the V & A, had received an MBE in the Queen’s New Year Honours list. This is belated news, with which I have only just caught up, but congratulations to Jane. How rare it is for someone working in an archival area to be recognised in such a way. I saw the MacMillan production in about 1990 – one of the most bizarre things I have ever seen, like the misbegotten child of Chu Chin Chow, an Elizabethan pantomime and Flower Drum Song. Someone took leave of their senses with that one. I wish someone would tell ‘them’ that just because Britten (whom I can, admittedly, leave every time) wrote the score, it doesn’t mean there is any merit whatsoever in this farrago. After reading your post, I had a look at photographs of the 1957 production – stylistically, it didn’t mesh, as far as I could see. Re. Jane Pritchard – yes, more than well-deserved, but it should have been an OBE at the very least. In between my various irritations I tried to listen to the music and it did seem quite danceable at times. It didn’t seem to end at the right time though and I found myself having to watch umpteen concluding dances. All in all not worth the amount I paid for a ticket. You are right David that ‘they’ should rethink it all. You set me thinking about cultural misappropriation, and I have been re-reading some of Hilda Butsova’s interviews, and also parts of Algeranoff’s memoir; what is always striking about Pavlova’s attitude towards other dance forms is how she didn’t debase and cheapen them in her own work, and how much she encouraged her dancers to immerse themselves in, for instance, authentic Indian, Japanese, Polish and Spanish dance forms (and it’s always refreshing, in view of the allegations of Pavlova’s conservatism, to remind oneself how highly she thought of Wigman, Duncan and Terpis). When you have time, do have a look at Sadlers Wells’ 1957 production photographs (ROH Collection on Flickr) – not as mad as the later revivals, but still crazy, with Balinese-type dresses, Elizabethan court-dress and ruffs for the men, and horned headdresses and gowns of the 1400s for the women, combined with scenery reminiscent of the designs Lucienne Day produced for Heal’s back in the 1950s.